Northern Savannahs of Cameroon harbour large populations of mega fauna and flagship species such as elephants, lions and derby eland as identified in WWF’s Global Programme Framework (GPF). Effective management of northern savannah ecosystems are a priority for our work on helping protect mega fauna species. 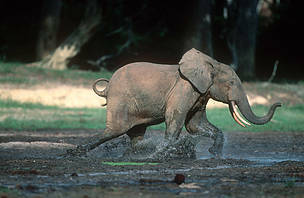 However, transboundary elephant poaching for ivory, unsustainable safari hunting and mining (artisanal and potential industrial mining), habitat degradation, are major threats, which if not checked, could spread to other priority regions of Cameroon. Key conservation targets: elephants, lions, hippos, giant eland, important bird species, wetlands & associated floodplain & Lakes.